Serenity Vista is excited to announce the acceptance of bitcoin as payment for alcohol & drug rehab treatment. Serenity Vista is proud to lead the way worldwide in offering bitcoin payment for alcohol or drug rehab. This initiative leads the addiction treatment sector and is consistent with our commitment to respecting each guest’s right to privacy and confidentiality. Your desire to seek help for addiction is your private matter. Paying with bitcoin gives a payment option that keeps this transaction private from employment, medical, legal, and financial systems. And, as bitcoin and other cryptocurrencies continue to gain mainstream adoption, bitcoin simply offers a convenient means of paying for rehab. Payment can be done from home without a trip to the bank or waiting for funds to transfer. Bitcoin may also offer a solution for those that have invested in bitcoin, yet may not have cash available when the time comes for needing to pay for rehab. In brief, bitcoin is the original and now-dominant, leading cryptocurrency. It is a peer-to-peer, open-source digital currency developed ten years ago. 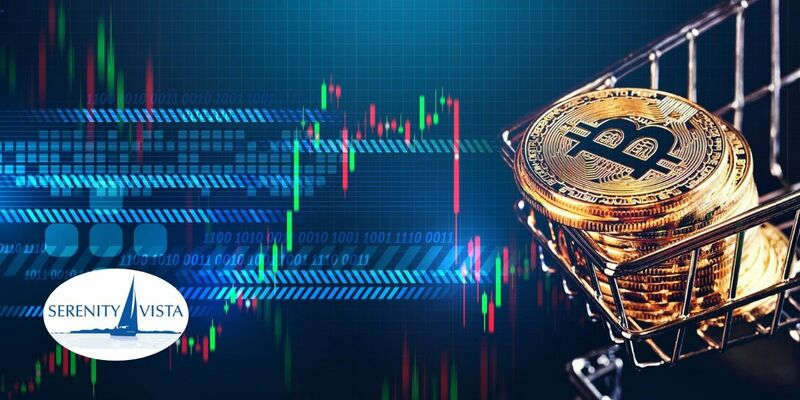 Bitcoin has received a lot of media attention in the last few years, with increasing credibility and reliability as it matures as an alternative to traditional fiat based currencies and payment systems. There are a variety of great reviews on the subject of bitcoin and various cryptocurrencies to consult for more technical detail. Bitcoin is a digital form of currency that has many advantages over traditional fiat money such as the Canadian or US dollar, euro or pound, and payment systems such as the use of credit cards and cheques through banks. There is no central authority governing bitcoin but rather a highly secure, ever evolving network of parties agreeing on exchange of bitcoin through information exchange, documented as a ‘blockchain’ through digital cryptography. Bitcoin is open-source and it’s design is public. With there being no central authority, bank or government involved, peer-to-peer transactions are open to anyone and nobody owns or controls bitcoin. Transactions are fast, inexpensive, secure, and highly private. Bitcoin is described as ‘permissionless’: you don’t have to ask anybody to use cryptocurrency and there are no gatekeepers. Bitcoin continues to evolve from a radically transformative breakthrough technology to a well established, stable form of currency. Increasingly, major companies are adopting bitcoin as a payment option, ranging from KFC Canada and Microsoft to Expedia.com, Intuit and Bloomberg online newspaper. Bitcoin is particularly ideal for the health care sector because of the significant privacy protections with the ultimate discretion provided by a nearly invisible form of payment. Serenity Vista feels strongly that people should be able to ensure their privacy of all aspects of their life, especially personal health related issues. Addiction treatment is no exception. Serenity Vista has carefully chosen a bitcoin payment system that is simple to use, fast, secure, and inexpensive. Bank transfer or wiring fees are avoided. You can follow the completion of the transaction from your own bitcoin wallet. Your rehab program can be paid for and secured in minutes, paid for either by an emailed invoice or pay now buttons on this site. See our pay with cryptocurrency page for details. Being the leader in the adoption of bitcoin as a means of payment is a reflection of Serenity Vista’s values. We are committed to staying current with the best ways of providing the optimal healing experience for our guests. As this technology evolves and continues to mature, other cryptocurrency payment options will likely be included. This is an indication of the thought and effort we put into providing payment options for our guests. Just image the effort, dedication and thoughtfulness behind your program experience once you enter the doors of Serenity Vista. We are dedicated to maximally helping you on your journey of recovery. accept bitcoin, accepts bitcoin, accepts crypto, accepts cryptocurrency, bitcoin, bitcoin for addiction treatment, bitcoin for drug rehab, bitcoin for rehab, crypto, crypto for rehab, cryptocurrency payment with bitcoin, drug rehab accepts bitcoin, pay for drug rehab with bitcoin, pay for rehab with bitcoin, pay for rehab with cryptocurrency, rehab acccepts bitcoin, rehab accept bitcoin, Serenity Vista accepts bitcoin. Bookmark. Do You Want What They Have?